Со временем забывается, какие сервисы ты тестировал. Можно посмотреть список приложений, которые имеют право к доступу к вашему твиттеру: https://twitter.com/settings/applications. Годится только для тех, у кого есть твиттер и кто с помощью него логинится к новым сервисам. Я в разное время давал несколько сот таких разрешений. Разумеется, большинство сервисов уже не существует. Connect your Twitter account to State to post your opinions and find your friends. Flipboard is a fast, beautiful way to flip through the news, photos and updates your friends are sharing. TrustCloud determines your trustworthiness from your online presence. Crowdfire – Go Big by Crowdfire Inc.
Crowdfire helps individual businesses such as musicians, painters, authors, coaches, freelancers, e-sellers and designers get things done on social networks. News360 is an application for the iPhone and the iPad that brings you all the current news, both global and local, in a stream customized and tailored just for you. RoundTeam Sign-In by RoundTeam Inc.
Social media productivity solutions for Twitter, Facebook, LinkedIn, blogs, and more. List users who have not updated their status in X number of days. Unfollow them with one click. Connect Photobucket to your Twitter account to share media! 500px is a photo community and a marketplace for discovering, sharing, buying, and selling inspiring photography powered by creative people around the world. What the Internet is talking about right now. Learn how to revoke an iOS app. Instagram on iOS by Burbn, inc.
A Facebook Application that helps bridge Facebook together to Twitter and vice versa. With Viber, everyone in the world can connect. Freely. Viber users can send free text and photo messages with other users. Users can also make free HD-quality calls. Find the best Android apps and games for your phone.Search for keywords or browse top lists.Share your apps with your friends. Twitterfall is a way of viewing the latest ‘tweets’ of upcoming trends and custom searches on Twitter. Updates fall from the top of the page in near-realtime. A coub is a looped video up to 10 seconds long. Get inspired and create your own coubs. Timehop: What were you doing a year ago today? Our app lets you search Twitter bios; measure yourself to competitors; audit & track followers; and find & cultivate key relationships. Check your Track! Aggregate all your online metrics using one single service. Wefollow is a directory of prominent people organized by interests. Selling should be as easy as sharing a link. CircleMe is new social app based on your interests, that lets you collect all the things you love in one place and discover new ones. The #1 Twitter statistics site. See your most popular tweets. Allow users to generate an auto tweet link for their website – type a message then click generate – paste the link into a website / blog for visitors to use & tweet about. This application will automatically tweet your new tracks and sets that you upload to SoundCloud. You’ll have to register an account on soundcloud.com to use it. who.unfollowed.me is a web based twitter app that lets you track your unfollowers, in real time, without waiting for a DM, or email. MeisterLabs develops smart and intuitive web apps. Our flagship products MindMeister and MeisterTask support your complete creative workflow from social brainstorming to collaborative task management. Get Twitter #analytics on any user, #insights on your mentions & RTs, monitor and download tweets, manage your lists and more… Get more #productive with Twitter today! AlterGeo – the best way to choose nearby spots, connect with friends, meet new people in café, night club or on the conference. AlterGeo – your guide in the city jungles. Outreach Desk by NeedTagger, Inc.
Tagbrand is the most popular social fashion network in Europe. PicCollage is a fun and simple way to create your own photo collages and share with your family and friends by email, Facebook or Twitter. Shazam gives you instant satisfaction for those times when you want to know what song is playing. Simply point your phone towards the music to learn more about the song. Custom fan pages for your tweets. Twubs is a social media website focusing on the use of hashtags to discover, engage and share in conversation and events. Twubs also allows organizations to setup contests that incentivize sharing. Vivino – Vivino helps you remember all the wines you drink and learn more about them. TweetReach by Union Metrics by Union Metrics Software, Inc.
Union Metrics Twitter analytics help social marketers measure the impact of their owned and earned media. A social front page for everyone and every site. Seesmic now offers the Twitter client you’ve been waiting for! A powerful feature-rich application that’s simple and easy to use. Pocket lets you save articles and videos to view anytime, anywhere – even when you’re offline. Access Sawhorse Media’s network of sites. Bluenod is a simple way to search and explore communities. Social Crawlytics will crawl a website and provide a report for each page, detailing share count over popular networks. Tell your friends about Games. Professional following and follower management. The best way to see and share life in motion. Share your images and videos on Twitter! SumAll brings the power of real-time business intelligence to small and medium-sized businesses. Summary of your social feeds! Яндекс.Музыка — ваш новый плеер. Миллионы треков на вашем телефоне, возможность сохранять их и слушать без подключения к интернету. MediaFire Twitter Integration for single sign on and quick post. Glympse(TM) is the easiest and most flexible way to safely share your location and real-time movement. You only share your location for exactly how long you specify and with whom you specify. Giving your site a tint of social. Untappd is a new way to socially share the brew you’re currently enjoying, as well as where you’re enjoying it, with your friends! Save web pages for later offline reading on your iPhone or iPod Touch. Exfm is the best way to find and share new music. A better way to manage your Twitter followers. Official Twitter for Windows application. oneQube is the first modular, cloud-based platform for the social enterprise of “me”! Instagram is a fast, beautiful and fun way to share your photos with friends and family. Swayy App by Summer Social Labs LTD. Your place for long-form reading. Make the most out of digital reading. Refollow helps you discover, manage, and protect your Twitter relationships. Twitter for Samsung Tablets by Twitter, Inc.
#BePresent by Sprout Social, Inc. Gauge your brand’s social responsiveness in real-time and compare yourself against industry benchmarks. Manage your Twitter friends. Check who unfollowed you, check who doesn’t follow you back and others. oneforty is your social business software hub. Review, share and discover the best tools that’ll make the most of your strategy. Qweeq is a simple, innovational and genious way to be connected to the World. Share pics, movies, audio records and much more with Qweeq! 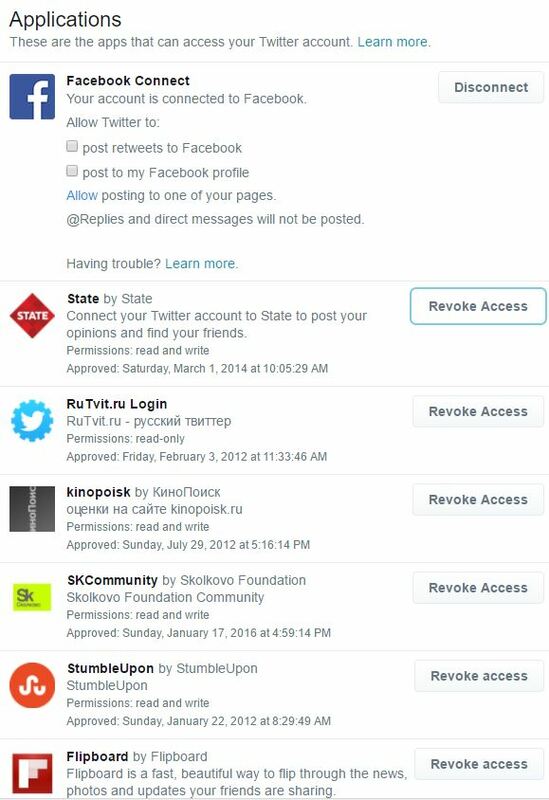 Monitor all your online services, including Twitter, from one place. Stampsy is a publishing platform for creative and compelling digital content. Share your vision. Twibbon allows you to show your support for a campaign via Twitter in a range of ways. You can add an overlay to your profile image, tweet your support and even update your Twitter background. Tired of drinking through the social media “firehose”? Try Topicurious and experience #SocialMedia on YOUR terms. Set your Tweets to disappear with a simple hashtag. Twitter Chat for Livestream Channel Pages. Twitoaster threads and archives your conversations, bringing you all the background, context and statistics you need. It’s all about improving & optimizing the way you communicate with your followers. The gateway for music search, discovery & play. Available for Android, iOS, Windows Phone, and Blackberry 10 mobile devices. Verify your Twitter account with Gravatar. TweetPhoto is a real-time photo sharing platform for the social web. Jelly is a new way to search with pictures and people from your social networks. ExactTarget SocialEngage powers your brand’s social media presence. Empower your team to publish and respond on social media channels. Sign in to wireless hotspots all over the world using your Twitter account. The crowd sourced database of startups, founders, and investors. Holo version of my fast and simple Twitter client for Android. Bold and beautiful. Discover the most retweeted tweet from any Twitter account! Look At Me is the first russian Internet edition about creative industries. Инвестиции 101 – научись инвестировать за 30 дней! The best way to track and share life’s most important numbers. Organize, read and share the content of your favorite websites. Easily find and share great content with your friends, fans and followers. SocialRank helps you find your best, most valuable, and most engaged followers. Base Twitter application for Social Media Today. Twibble.io – RSS to Twitter made simple. Easily feed content from any blog to help amplify the things you care about. Hands free twitter account management. Riffle is a super-smart Twitter dashboard that helps you develop more meaningful relationships with your community. Tweeter Karma simplifies routine friend and follower management, offering different filters and sorting options for your entire account, all on one screen. Tweet Full by Pro Start Me Technology Pvt. Ltd. Buffer is a service to help you tweet interesting and valuable content to your Twitter followers more consistently. Songkick will automatically tweet your upcoming gigs and events added to your gigography. What is the value of your Twitter account? Sniply is the only way to drive conversion through the content you share. Embed your call-to-action to any article on the web. connects your stereomood account to your twitter account. Taptu – DJ Your News by Taptu Ltd.
Twitlistmanager offers a comprehensive way to manage your Twitter lists. RunKeeper allows you to track, measure, and improve your fitness (Distance, time, speed, pace, calories burned, elevation, and path traveled on a map as well as your weight and body fat). Share links on social networks? Trunk.ly pulls the links together and make them searchable. Give A Share. Get A Share. Explore the world through someone’s eyes! The best writing tools, ever. Press a button, start a talk show. The social media dashboard which allows teams to broadcast, monitor and track results. Brings new tweet notifications to Chrome – You’ll never need a desktop client again! Monitor changes in your Twitter followers over time and keep a history of followers that have been lost or added. tvtag is the place to be while watching TV. Tag along with others while you watch your favorite shows. TweetChat helps put your blinders on to the Twitter-sphere while you monitor and chat about a hashtagged topic. Search twitter. Find relevant content. Quick and easy way to gather followers’ opinions and get statistics. We harness the power of social networking and blast your thoughts, muses, complaints, frustrations, gloats, rhymes and other flavorful compounds all over the internet. Springpad by Spring Partners, Inc.
Springpad is your personal organizer. Squidoo is the popular publishing platform and community that makes it easy for you to create “lenses” online. Tweet your WordPress.com posts and comment on WordPress.com using your Twitter identity. Play all the music you love! Access and share 35 million tracks. Enjoy the latest releases and editorial recommendations. Try it for free! Assists with managing your Twitter account. ManageFlitter promises never to post tweets or perform actions in your Twitter account, on your behalf, unless explicitly requested or configured by you. The Tweeted Times is a real-time personalized newspaper generated from your Twitter account. Twitter account manager. Friend or Follow does not post unexpected tweets or perform updates you do not explicitly request. The leading Twitter community manager. Please note: We never post anything or follow/unfollow without your explicit permission. Sign in Now – it’s FREE! Tune in and listen to your social networks. Write more than 140 characters. Socialcam is a mobile video application for iPhone and Android that makes it fast, easy and fun to capture, share and view high quality videos of life’s moments with friends and family. Disqus is a service and tool for web comments and discussions. Bookmark the links you tweet, retweet and favorite to your preferred bookmarking service! A fun way to share what your fellow bloggers are blogging about. glmps is a application that allows you to share the video of the photographic moments of your life. UberSocial for Android by UberMedia Inc.
Twitter Cloud is a service that lets you generate a cool looking cloud of the words your tweets mostly contain. Spring is a service that allows your friends and followers to ask you questions, anonymous or not. You can respond to those questions and optionally publish responses to Twitter or your blog. Real Time Targeted Marketing on Twitter. about.me, the place to create your personal page with a purpose. Livefyre powers social everywhere and replaces static comments with real-time conversations. Foreca.st by Hurricane Party Inc.
Hellotxt is a free tool to aid you in the communication and digestion of all your social information. We make it easy to post text and media to separate accounts on multiple social networks. TweetCaster is the premier Twitter client for Android devices. The social media application for teams to plan content, monitor keywords and manage audience. Oink App by Milk Inc. Ask friends anything and get video answers. Streaming all of your favorite radio from around the world!